Europe has become more integrated legally in the last ten years and more divided politically and spiritually and emotionally, says former Taoiseach. Former Taoiseach, John Bruton, has warned that the lack of emotional and spiritual support for the European Union could ultimately lead to its break up. There is the absence of both “symbolic” (in form of a flag or anthem) and “emotional support” and the lack of a “common conversation” in the form of an election of, for example, the President of the European Commission. He added that a lot of countries had applied to join the European Union, not because they wanted to share European solidarity but because it suited them to join the EU as a means of bolstering their position against some neighbour that was not a member. Asked about the ‘vocation to Politics’ mentioned in the introduction to his book, a collection of 47 essays, on Irish Politics, Economics, History and Religion, Mr Bruton said that politics was about serving the general interest and not just yourself. For this reason, politicians are often the subjects of criticism, he said, but a politician who spent his or her life avoiding criticism “would not be doing the job of a politician properly”. Democratic politics are the last defence against other forms of government that would be far more oppressive, he said, noting that when the Communists were coming to power in Russia and when the Nazis were coming to power in Germany, “they traded on anti-politician sentiment” which can be exploited by people who have “profoundly dangerous viewpoints and plans”. In the run up to the general election, Mr Bruton said he thought the public should have respect for people who enter politics. The title of his book, ‘Faith in Politics’ is deliberately ambiguous. He said his own faith had helped him to understand the value of each human life, whether born or unborn. He believed the reasoning of the Supreme Court in the X case (which then became embodied in the Protection of Life during Pregnancy Act) was ‘entirely wrong’. If something is a criminal offence and taking a life is a criminal offence, he said, the threat of suicide ought not be a ground to render something legal that in every other circumstance would not be legal. 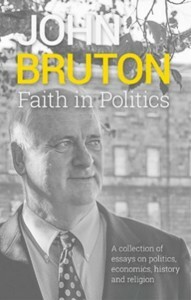 Faith in Politics by John Bruton is published by Curragh Press.